A pool worker who almost drowned himself in a Fairfax apartment complex pool has filed a federal lawsuit against county police officers and a pool company. WASHINGTON — A man who couldn’t swim, but came to Fairfax County to work at a pool in 2016 and almost drowned himself, has filed a federal lawsuit against the lifeguard who pulled him out of the water and the county police officers who resuscitated him. Lawyers for Mateusz Fijalkowski, 23, have filed suit in the U.S. District Court in the Eastern District of Virginia, saying police and the lifeguard violated Fijalkowski’s constitutional rights by not doing more to keep him from harming himself during an obvious bipolar episode. The suit names 11 county police officers, a lifeguard supervisor and the pool company. Fairfax County Police Chief Edwin Roessler fully supported his officers’ handling of the situation. According to the suit, Fijalkowski was hired to work as an assistant pool manager at Riverside Apartments even though he didn’t know how to swim. In his third day of work, on May 26, 2016, Fijalkowski reported to the pool to clean it, arrange deck chairs and check the water’s pH level. Witnesses said he acted strangely, arguing with guests and pulling the plastic wristband from a girl’s wrist. After the Fairfax County police arrived, Fijalkowski ignored them, climbed the lifeguard tower and repeatedly blew his whistle. According to court filings, police cleared the pool area of guests. leaving only officers, Fijalkowski and other pool personnel. Fijalkowski’s attorneys posted a video on YouTube of the incident, which was captured by an unidentified bystander. Eventually, he put down the buoy, and walked down a metal ladder in the shallow end of the pool, and began walking toward the deep end. After several seconds, Fijalkowski was completely submerged in the deep end of the pool. 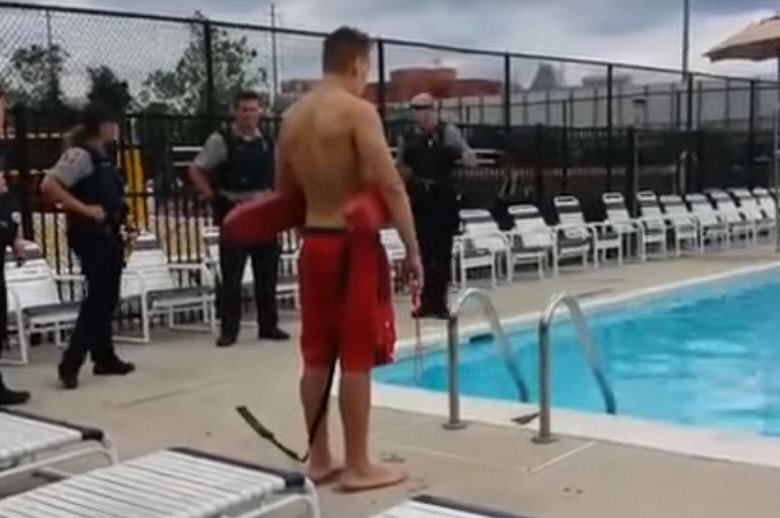 As pictured on the video, once Fijalkowski was under water for more than 30 seconds, officers walked to the deep end of the pool to observe him. According to a report from the pool company included in the lawsuit, officers instructed the lifeguard on duty not to dive into the water to save his co-worker, for the sake of the lifeguard’s safety. After more than two minutes, police officers began taking off their belts, apparently getting ready to dive in; the lifeguard dove into the pool, and quickly brought the unconscious Fijalkowski to the surface. Bystanders on the video described Fijalkowski’s face as purple as county police began CPR and continued the lifesaving measures for several minutes. The attending doctor’s notes at the emergency room of Inova Fairfax Hospital say officers dove in to save Fijalkowski after he had been under water only between 30 and 60 seconds. The lawsuit alleges the misrepresentations from police affected Fijalkowski’s due process, in that he didn’t receive the treatment appropriate for someone who had been underwater for several minutes. “When it became apparent he had drowned himself we executed the plan, and it’s clear from the video that we saved his life,” Roessler said. Fijalkowski remained in Fairfax Inova’s Heart and Vascular Clinic until June 8, then was transferred to a psychiatric unit for six days. He was diagnosed with bipolar disorder. His attorneys, Victor Glasberg and Maxwelle Sokol, said Fijalkowski has returned to Poland with his father. In their suit, Glasberg and Sokol said officers should have taken Fijalkowski into custody before he had a chance to enter the water for the third time. He said police officers are trained to deal with agitated suspects who are in the midst of an acute mental health episode.